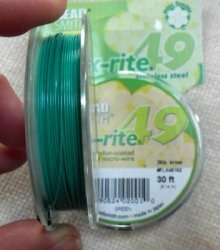 This is the wire I use on Jewel School in the Kumi-Flex kits. 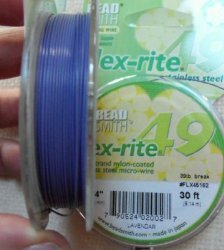 It makes a GREAT flat kumihimo braid, and as you might imagine, it's a great standard beading wire as well. 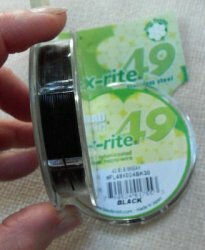 This is the 30" roll of 49 strands of stainless steel covered in black nylon. It's strong, flexible, kink & abrasion resistant. Ah, if only it would wash the dishes! This is the 30" roll of 49 strands of stainless steel covered in blue nylon. 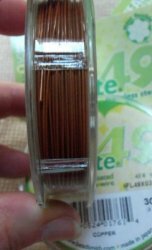 This is the 30" roll of 49 strands of stainless steel covered in copper nylon. This is the 30" roll of 49 strands of stainless steel covered in green nylon. 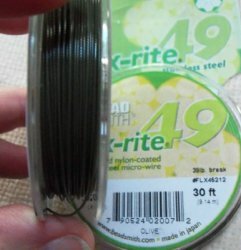 This is the 30" roll of 49 strands of stainless steel covered in olive green nylon.